Below is a larger selection of painted steel boat trailer axles for your trailer. Ideally, these Painted Steel axles are used on trailers in freshwater, or very minor saltwater usage. While they are very duty, they do not feature corrosion resistant properties needed for saltwater use. These are 3,500lb Capacity Trailer Axles that feature a 2 3/8" Diameter Axle Tubing. If you are needing new Axle Mounting U-Bolts to re-mount your axle to your trailers leaf springs, they are available in the Boat Trailer suspension Parts Category. All of these Axles feature the industry standard #84 Spindle, which uses 1 3/8" Inner Diameter Wheel bearing and 1 1/16" Inner Diameter Outer Bearing. The 1 3/8" is the larger inner wheel bearing, while the 1 1/16" is the smaller outer wheel bearing. 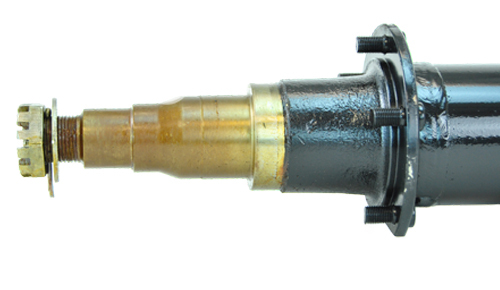 The Grease Seal used with these axles would be the standard UHI 1.72" ID Grease Seal. We have these axles available with loose springs seats, meaning the Leaf Spring Mounts are not welded to the axle, and also with pre-welded spring seats, meaning the spring seats are welded at a specific location. For Questions on howto measure you trailers axle, check out the "How to Measure Your Trailer Axle" Tab, the video shows a galvanized axle, however, the methods for measuring your painted steel axle would be the same. Determine your Hubface and Spring Seat, and select the axle sign that best outfits your needs. If you are needing Hubs for your Axle, we have them in Hot-Dipped Galvanized with included Bearings and Grease Seal to Outfit your Axle. We also have the required Accu-Lube Dust Caps to outfit these Axles. All of these Painted Steel Boat trailer axles feature this Accu-Lube system. You will grease your bearings through the zirc fitting on the tip of the spindle. The grease exits out a port just inside the Grease Seal, the grease then greases the rear bearing, moves forward, greasing the front bearing, and finally forcing old grease out the opening in the Dust Cap.